The Andersons announced that it has successfully completed its acquisition of Lansing Trade Group. This transaction was originally announced on October 15, 2018, and closed effective January 1, 2019. Watch as members of our Grain team talk about their purpose in serving our customers, what connects them to the industry and how they play a part in fulfilling our mission every day. 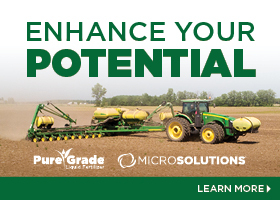 Enhance the genetic potential of your seeds and promote microbial activity in the seed furrow with a starter additive. We offer organic growers, and those transitioning to organics, a portfolio of products and services.